A coyote that attacked a Salisbury, Vermont couple outside their home last week has tested positive for rabies. 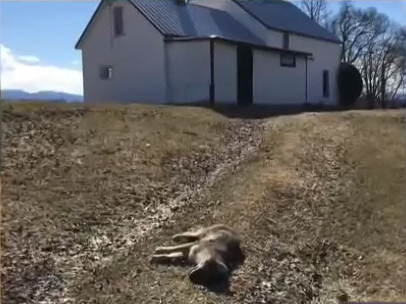 The Vermont Health Department confirmed the coyote was rabid two days after the attack. Its the second coyote to test positive in Vermont’s Addison County this month. Priscilla and George Gilman were treated at Porter Medical Center in Middlebury for wounds sustained during the attack. Priscilla Gilman was bitten on the right forearm and left leg, while George Gilman was bitten on the right leg, according to local news reports. The elderly couple also received four rounds of rabies shots. “My husband kicked him in the head, and the coyote would back up and lunge at us again. He went for my husband’s throat and bit me in my arm and leg. My husband kicked it and said, ‘Head for the house.’” Mrs. Gilman told local reporters after the incident. George Gilman, in his 70’s, grabbed his shotgun and headed back outside to ensure the animal didn’t leave the area to inflict physical damage somewhere else. According to the Gilmans, the coyote charged again, biting the barrel of his shotgun. After the coyote let go, George dispatched the animal with a mortal shot. Vermont Game Warden Dale Whitlock, who arrived on scene, collected the animal’s carcass; which was estimated around 40lbs. Whitlock told reporters the coyote appeared to have a faint odor of skunk essence, suggesting the coyote may have contracted rabies from an infected skunk - one of the primary carriers of the disease. Mark Scott, wildlife director for Vermont Fish & Wildlife, told news outlets this would be the first confirmed report of a rabid coyote ever documented in the state if the test were to confirm rabies. Wednesday’s test results confirmed expectations that the coyote which attacked the Gilmans was in fact suffering from the rabies virus. According to officials, three past instances of coyote attacks on Vermont residents have been documented. Two taking place in 1991, and another in 2004. A fourth incident was recorded in 2008 when a photographer in West Dover was chased by a coyote. Several more accounts of an aggressive coyote were reported in the same area. Commissioner Louis Porter told media outlets Wednesday that while coyote attacks on humans in Vermont are rare, they are not unknown. “I should add that coyotes are amazing animals and fulfill an important role in our ecosystem” he said, following the attack. Days after the Salisbury incident, a second coyote tested positive after exhibiting aggressive behavior in nearby New Haven, Vermont. While coyote attacks are certainly rare, there appears to be a theme in the Northeast with increasing coyote conflict. Both Massachusetts and Quebec have multiple recent headlines with coyote attacks on people. Vermont lies in between the two. Urban conflict with the wild canids come as animal protectionist groups have ramped-up campaigns to greatly restrict coyote hunting in the region. The topic of coyote management has made headlines in Massachusetts, New Hampshire, and Vermont recently. Four months earlier, three Vermont residents were attacked by a rabid bobcat in the state’s Upper Valley region. The news of last week’s coyote attack comes as USDA Wildlife Services-APHIS continues to conduct rabies surveillance and vaccination attempts in the Northeast United States, which includes Vermont. You can read our full report on the USDA’s rabies program here. Department of Energy and Environmental Protection (DEEP) officers tracked down the animal and euthanized it after they were called to a Mohegan Sun Golf Course in Sprague, Connecticut, after a bobcat attacked the unidentified golfer that morning. "At this point we believe there may be two or more cougars involved," conservation officer Ben York told reporters on Friday of last week. Teen attacked by coyote in Massachusetts neighborhood. A 16-year-old girl says she’s “fortunate to be alive” after reportedly being attacked by a coyote outside her Massachusetts home on Sunday evening. The attack occured as debates about coyote management in the Northeast are intensifying. Increase in attacks prompts Montreal to enact coyote "hazing"
Montreal rolls out “hazing” plan for wily coyotes in the midst of 19 recorded attacks on people. A bobcat that went on a two-day rampage in the Upper Valley region of Vermont was rabid. Vermont Fish & Wildlife confirmed the testing of the animal’s remains on Thursday came back positive for the rabies virus. Raw Predators: A Bear-Eat-Bear World. Nature’s raw fury: A grizzly bear in Alberta locates and tears open a black bear den; attacks female bear with cubs. Warning: Potentially graphic content. Hoarding and stockpiling our wildlife never works. One way or another, New Hampshire’s public, politicians, and the NH Fish & Game Department are going to have face the reality that nobody should be proud of New Hampshire’s Dumpster Cat. The Wily Coyote: Leading the next fur renaissance? 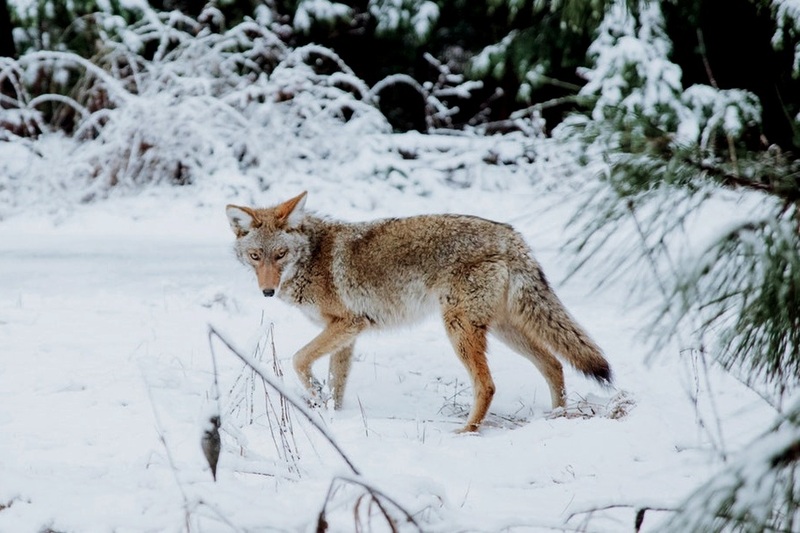 Fur-trim coats, new recruits in the hunting community, and the coyote’s adaptability to urban existence have led to increased interest in the country’s most resilient wild canid. The trapping community heard undertones of coyote fur being in demand early on this season, but it wasn’t until the past few months that the mainstream media really started to catch on. NH hunting critics’ house of cards - quickly becoming “uninhabitable”. When a density-dependent disease was believed to be threatening our fox and fisher populations, these same camps blamed the state’s trappers. When hunters were assisting the state with moose biology through harvest data, these camps were working to stop the state’s moose hunt. When volunteer trappers were assisting with bobcat population dynamics, these people were busy claiming the NH Fish & Game Department was “working only for hunters”. We now find ourselves all here again under the bright yellow circus tent of a coyote hunting bill, with the same jokers claiming the “moral majority” once again.